A powerful dryer designed specifically for the barber's shop. 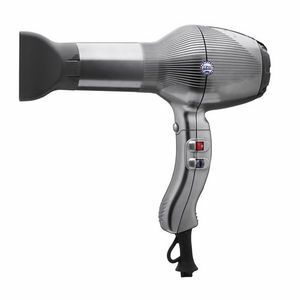 Gamma Piu's Barber Dryer is a robust yet surprisingly light, powerful dryer designed for the barber's shop. Weighing in at only 560 grams and delivering an airflow of 99 m³/h, it really means business. The ergonomic grip with switches on the side complement a dryer with strong male branding and an exclusive design that marks it out from the herd of unisex dryers. It's got settings for both hair and beard and a cold shot button to set the style. It also features a professional-length, 3-metre cord attached to the casing by a bell-shaped strain reliever that reduces the risk of the cord snapping. It's 100% Italian designed and manufactured and comes with a 12 month warranty. £83.39 (inc. VAT) Why no VAT? We're a trade wholesaler and quote our prices without VAT to help our VAT-registered customers understand the true cost of a purchase.